Understanding the structure of Canada Reads is essential for understanding the pleasures it offers the listener. A good place to start is with judging. While literary awards’ judging is typically done behind closed doors, away from public eyes, as critic James English argues, one of the pleasures of awards culture are the scandals that come out of awards. Debates over what books ought to have won will sometimes leak out from the judges’ closed deliberations and into the media, producing a spectacle. 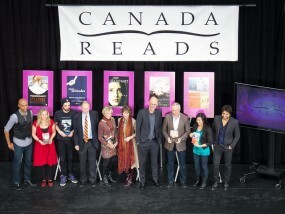 In the case of Canada Reads, the judging of the award, and the potential conflicts that can arise out of such an event, are placed front and centre. As Gillian Roberts argues, “[u]nlike the Governor General’s Award and the Giller Prize, Canada Reads is itself a substantial text through the broadcasting of the on-air elimination discussions. In this way, Canada Reads is not simply the sum of its nominees; rather, the celebrity judges feature prominently in the text of Canada Reads and are highly visible (or, indeed, audible) component of the competition itself” (37). Because the archive of Canada Reads is public, it is possible for scholars to read or listen through these discussions just as they would work through any other archival text. Each year, five celebrity panelists choose one book from a shortlist to defend in the contest, and engage in on-air debates. At the end of each episode of the five-day competition, the panelists vote off one book, until the final remaining book is crowned the winner. A French-language version of the competition called Le Combat des Livres runs annually on Radio-Canada, the CBC’s French service. Although not strictly a book prize in the vein of the Giller or Governor General’s Award, Canada Reads is marketed as a major literary event and ascribes value to all of the books involved. Jian Ghomeshi, host of CBC’s Canada Reads since 2008. 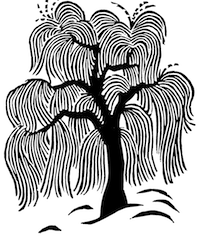 By Penmachine (Own work) [CC-BY-SA-3.0 or GFDL], via Wikimedia Commons. From the beginning, CBC has taken a deliberately populist approach with Canada Reads. Rather than employing scholars to discuss the merits of literature, CBC recruited celebrity judges from various fields to defend the books. The hosts of Canada Reads over the years are also popular media personalities: comedian Mary Walsh hosted in 2002, broadcaster Bill Richardson took over from 2003 to 2007, and Jian Ghomeshi took over in 2008. Ghomeshi, host of the CBC Radio arts and culture show Q , is a crucial part of Canada Reads’ enduring popularity. Well-known in Canada and the United States for his in-depth interviews on Q (and a celebrity in his own right), Ghomeshi lends Canada Reads the allure of a trusted cultural mediator known for delivering engaging content to the nation. The show casts a wide net to draw in celebrity panellists to appeal to different demographics. For example, the panel often features a star that appeals to a younger audience such as actor Jay Baruchel (2013) or musician Sara Quin from the band Tegan and Sara (2011). For audiences that don’t connect to stars like Baruchel and Quin, CBC invites other prominent figures such as politicians, athletes, comedians, and journalists of various backgrounds. Often, the panel will feature at least one writer to give the debate more literary credibility. The idea is that fans of celebrities will tune in to hear what they have to say about books, exposing a wider audience to discussions of Canadian books. The CBC and Canada Reads use celebrity endorsement with the hope of encouraging readers, new and old, to read and buy Canadian books. 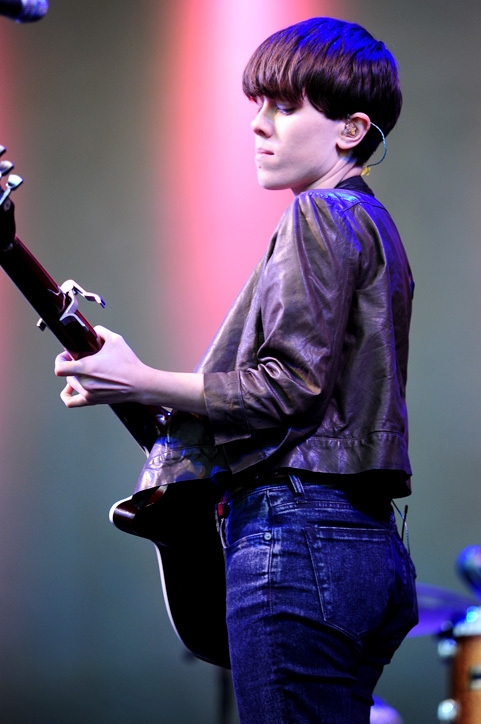 Musician Sara Quin, a Canada Reads panellist in 201.1 By Stuart Sevastos [CC-BY-2.0], via Wikimedia Commons. The celebrity personalities are key to attracting attention to the event. This is especially noticeable since 2011, when the debates were extended from 30 minutes to one hour and relocated from Ghomeshi’s Q studio to a larger, television-friendly studio with an audience. 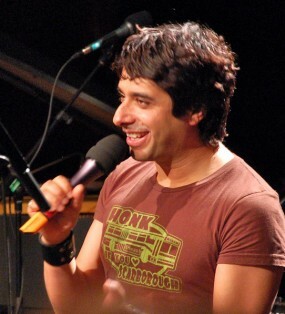 For example, on Day Two of the 2013 event, Ghomeshi spends the first 15 minutes of the program checking in with the panelists and getting their thoughts on the contest before getting to the actual book discussion. Still, Danielle Fuller notes in “Listening to the Readers of ‘Canada Reads,’” that the readers of Canada Reads tend to privilege their own reactions to the text over the opinions of the judges. In this sense, the celebrity and game aspects of Canada Reads function as an entry point into the purported real purpose of the show, the discussion of books.